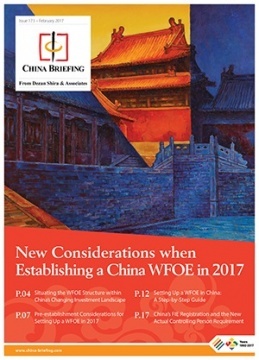 In this edition of China Briefing, we guide readers through a range of topics, from the reasons behind foreign investors’ preference for the WFOE as an investment model, to managing China’s new regulations. We discuss how economic transformations have favored the WFOE, as well as the investment model’s utility, and detail key requirements that businesspeople need to examine before initiating the WFOE setup process. We then walk investors through the WFOE establishment process, and, finally, explain the new and idiosyncratic “Actual Controlling Person” regulation. Foreign investors can use a range of investment models to enter the Chinese market. Experienced businesspeople in China note that, for first-time investors and SMEs, the representative office (RO) has traditionally served as the most popular investment structure, long making it the most commonly used model for foreign companies. This, however, is beginning to change. As the Chinese economy continues to mature, Dezan Shira & Associates has assisted an increased number of foreign investors with the establishment of their wholly foreign-owned enterprise (WFOE) – an investment model with a far wider business scope than the RO. The past year, in particular, has been a formative one for the China WFOE. In tandem with its rise in popularity, the Chinese government has implemented new regulations affecting the WFOE business structure and setup procedure, mostly by cutting red tape and streamlining the overall process. In this edition of China Briefing, we guide readers through all these changes: from the reasons behind foreign investors’ preference for the WFOE as an investment model, to managing China’s new regulations. We discuss how economic transformations have favored the WFOE, as well as the investment model’s utility, and detail key requirements that businesspeople need to examine before initiating the WFOE setup process. We then walk investors through the WFOE establishment process, and, finally, explain the new and idiosyncratic “Actual Controlling Person” regulation. This magazine is based on our experience of managing WFOE setups for a diverse array of foreign businesses. For readers looking for more information on the subject, please contact the advisors at Dezan Shira.